Royal Mail delivers strong Christmas performance - but will it last? The former state monopoly is keeping pace with its rivals. For now. Back in November things were looking difficult for Royal Mail. Little more than a year on from its IPO, it reported a 21% fall in half-year profits and a 1% decline in sales for its parcels business, amid biting competition from the likes of Amazon and Whistl. Today things are looking better, if not amazing. In the nine months to December 28th Royal Mail's revenues were up 1%, as parcel volumes jumped 3%. Letter volumes continued to fall, presumably as people continue to wake up to the benefits of email, but the company said that was in line with expectations. It looks as though Christmas demand could help keep the company on track to meet its forecasts. The figures are likely a source of relief for Greene. Royal Mail's share price has been slowly sliding since peaking at 615p in January last year, a couple of months after it was privatised. This morning they were up 4.07% to 448p. There are threats on the horizon though. Greene has spoken before about the strain placed on the business by its universal service obligation, which forces it to deliver to any address in the UK for the same price. 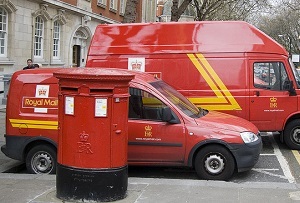 Its rivals can 'cherry pick' the most profitable routes, arguably making it more difficult for Royal Mail to compete on a level playing field. With Amazon stepping up its Sunday deliveries and competition getting increasingly fierce, Greene has a battle on her hands to keep delivering the good news.